In the early hours of the January 28, the telecommunications satellite Hispasat H36W-1 (H36W-1) — produced by space technology company OHB System AG — reached its target orbit at an altitude of 36,000 kilometers. A Russian Soyuz carrier had lifted off on schedule at 2.03 hours CET from Europe’s Spaceport in Kourou, French-Guyana, pushed by the Arianespace launch vehicle. Roughly half an hour later, the carrier released the satellite with a mass of 3,200 kg into geostationary transfer orbit. The successful launch of the first satellite from the SmallGEO range marks a milestone in OHB’s history. SmallGEO is the first telecommunications satellite to be developed, integrated and tested in Germany for more than 20 years. Artistic rendition of the Hispasat 36W-1 satellite. Image is courtesy of OHB AG. The German Aerospace Center (DLR) satellite control center received the first “sign of life” from the satellite just under one hour later via the ground centers in Kumsan, South Korea, and Uralla, Australia. Twenty-two employees from OHB System AG, four from OHB Sweden and two from OHB Italia, are working around the clock at the satellite control center to ensure the smooth start-up of the telecommunications satellite and to support mission control. H36W-1 will be reaching its geostationary test position in 12 days’ time, where the spacecraft will be calibrated and placed in operation over a period of approximately five weeks. After a voyage of a further nine days, the satellite will reach the final position at 36 degrees longitude west, where communications services for Europe, the Canary Islands and South America will be provided by Spanish operator HISPASAT over a period of more than 15 years. Developed by OHB System AG as part of the ESA ARTES program (Advanced Research in Telecommunications Systems), SmallGEO is a flexible geostationary satellite platform which can be tailored for different mission goals such as telecommunications, Earth Observation (EO) and technology testing. With its modular structure, the SmallGEO satellite platform can be modified flexibly to meet specific customer requirements. Customers can select a classic, hybrid or electric propulsion system for the satellite. Depending on the type, the satellite has a launch mass of between 2,500 and 3,500 kg, with a permitted payload mass of between 450 and 900 kg. Measuring 3.7 x 1.9 x 2 meters, H36W-1 had a launch mass of 3,200 kg. In addition to OHB System AG acting as the prime contractor, three of OHB’s European sister companies were also involved in the successful development and realization of this first SmallGEO satellite and will also contribute to future SmallGEO platforms. OHB Sweden delivered innovative subsystems for electric propulsion and attitude and orbit control. Luxspace delivered the telemetry, telecontrol and ranging subsystem and actively participated in its validation at the satellite level. In addition, LuxSpace contributed to the development of the satellite simulator. OHB Italia developed the payload management unit and supported system engineering of the thermal control subsystem. The first SmallGEO satellite, the H36W-1, was completed in the form of a private-public partnership between ESA, OHB and the Spanish satellite operator HISPASAT. Further projects in the conventional telecommunications segment include EDRS-C (laser relay) and Heinrich Hertz (in-orbit verification of numerous national scientific and technical innovations as well as satellite communications for the German federal armed forces). OHB is developing Electra, a satellite with a fully electric propulsion system based on the SmallGEO platform, which will be able to carry a substantially larger payload due to the lighter weight of the propulsion system. Europe’s future fleet of weather satellites, the “Meteosat Third Generation” EUMETSAT satellites, is also based on the SmallGEO satellite platform. 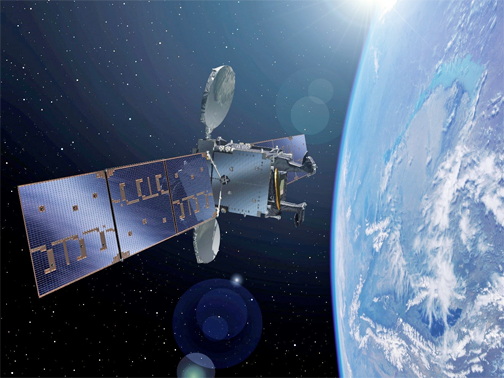 According to Dr. Dieter Birreck, the responsible project manager at OHB System AG, the first satellite is always a major step, particularly in the case of a new specially developed platform in such an important segment as the telecommunications market. OHB AG has developed, managed and implemented an integrated design, which has been intensely tested during an 11 month test campaign. OHB System AG is one of the three leading space companies in Europe and the firm belongs to listed high-tech group OHB SE (ISIN: DE0005936124, Prime Standard), where around 2,200 specialists and system engineers work on key European space programs. With two strong sites in Bremen and Oberpfaffenhofen near Munich, and packing 35 years of experience, OHB System AG specializes in high-tech solutions for space. These include low-orbiting and geostationary satellites for Earth observation, navigation, telecommunication, science and space exploration as well as systems for human space flight, aerial reconnaissance and process control systems.